Afternoon tea or Memory Lane cafe days. but there are a few places left for all other dates. Important information: Parking in Clayton Hall compound is for disabled badge holders only. Park on side streets or in bays at front of park on Ashton New road. Please be aware of parking restrictions which apply when Manchester City FC are playing at home and be sure to park outside restricted area. St. Cross parish church will be open from 1pm till 3pm on all open days in co-operation with Clayton Hall. The Old Hall quilters meet every other Sunday from 12 till 4pm. 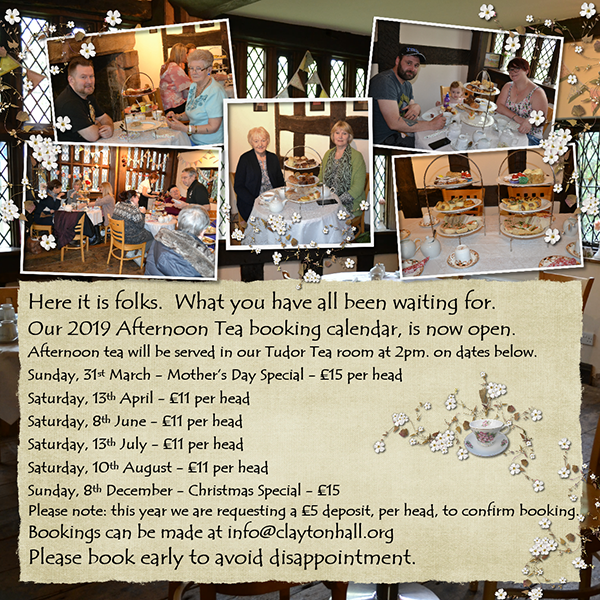 If you would like to support the Clayton Hall project there are various ways that you can help. 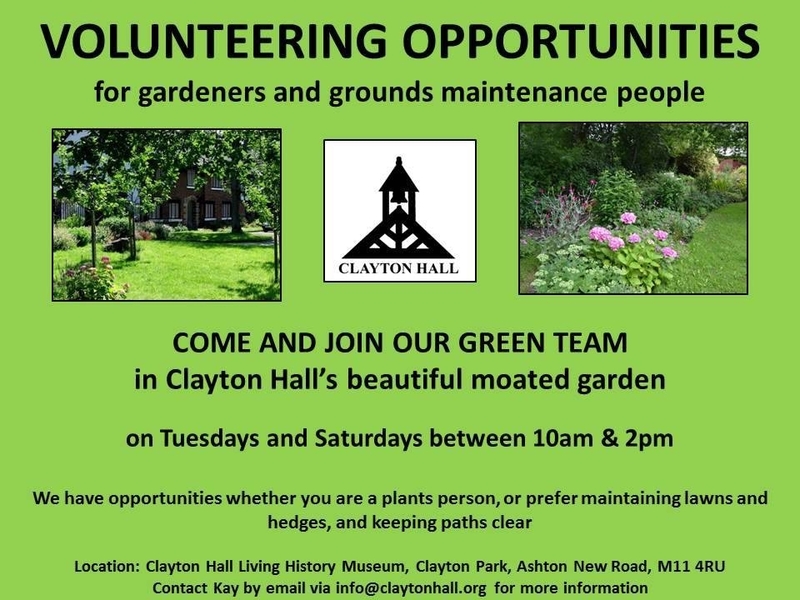 You could become a Friend of Clayton Park, just come along to the next Friends meeting date to be arranged, at Clayton Hall, you will be made very welcome. You could volunteer your time to help in the Hall or garden. You can make a donation to the charity by clicking on the Paypal link at the bottom of this page. Your donations will help us to keep admission free on public open days and with the upkeep and day to day running of the Hall. If you have enjoyed your visit please add a review on Trip Advisor and help spread the word about our wonderful old hall. Clayton Hall is a Grade 2* listed building and a rare example of a moated, medieval site. Standing on a scheduled ancient monument it is situated in Clayton Park, Ashton new Road, Clayton, Manchester M11 4RU. The original hall was built for the Clayton family in the 12th Century, it later passed into the hands of the Byron family, of which the poet Lord Byron was a member. The Byron’s lived here until they sold it to two London merchants, George and Humphrey Chetham. Humphrey is famous for founding Chethams School and Library in the centre of Manchester. Externally the building is finished mainly in red brick, with some square-panelled timber framing at first floor level. Viewed from the front, the right hand section is the older part of the building, dating back to the 15th century and altered in the 16th and 17th century. It was partly rebuilt and enlarged in the 18th century with further remodelling taking place in the early and late 20th century. Rooms in the later part of the building have been dressed in Victorian style and offer an opportunity to see what it would have been like to live here in the late 1800's. The timber section includes a Clayton Hall/Manchester memories room, a Humphrey Chetham room and a tea room/gift shop. Access to the Hall is via a Grade 2 listed, masonry bridge over the moat (at present dry). The bridge is thought to date from the 17th century and is constructed of coursed square sandstone over two segmental stone arches. 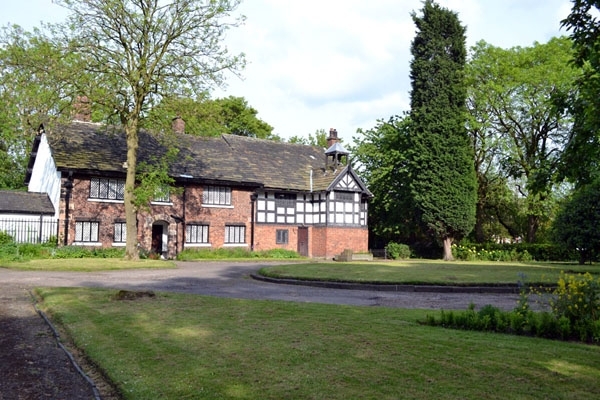 Clayton Hall is owned by Manchester City Council and managed by the Trustees and Friends of Clayton Park who open the Hall to the public and organise and run school and group visits.